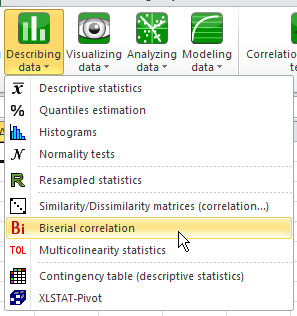 This tutorial shows how to compute a biserial correlation coefficient between a quantitative variable and a binary variable in Excel using XLSTAT. The data used in this tutorial correspond to concentrations of a particular molecule measured in blood samples of 30 mice, split into two different groups depending on their species. We want to use the biserial correlation to check whether there is an association between the concentration and the species. 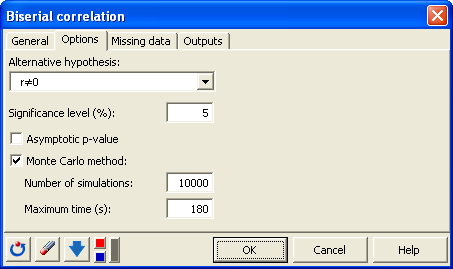 The biserial correlation requires that we have one binary variable and one continuous variable. The variance is assumed to be the same whatever the group to which an observation belongs. 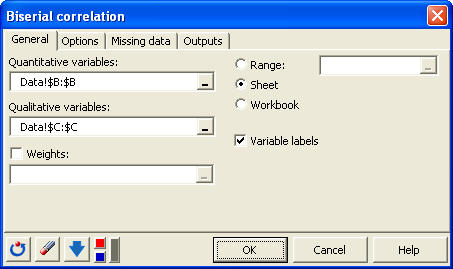 The biserial correlation is useful to evaluate the degree of association between a binary (or dichotomous) variable and a continuous variable. Its values range between -1 and 1. 0 corresponds to no association.